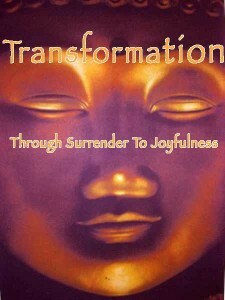 To be joyful is to find an inner peace so deep, so vast, that one is enveloped within a transcendent power. All Mind is surrendered to a greater Beingness, where time stands still and a powerful sense of acceptance seeps into every atom, molecule and elemental structure of consciousness. It is a wondrous reality that is entirely possible for all beings to experience. This sense of acceptance that is all-pervading exists beyond the usual human struggle of the mind and emotions. Humanity has been gifted a life and path that often feels extremely limited and harsh, yet the very decision to take on a physical body created a new styled pathway of evolvement. Angelic consciousness merged with the animal elemental hierarchies to create the new dynamic Angelic-empowered Humanoid! Two minds enmeshed, struggling for supremacy has resulted, and now eons down the track in earth time the struggle still remains. The Angelic Mind of higher enlightened frequencies continues to attempt to awaken the lower mind of the Animal realms to accept that each frequency of expression has a place within the Universal scheme and that no individual identity is lost. In this persistent struggle The Lower Mind has continued to resist a complete merging and has thus created a sense of separation and battle within us, the Angelic Humanoid. We are two minds enmeshed, struggling to find peace and harmony through the acceptance that WE are All Powerful, God-invoked Beings with a capacity beyond our own imaginings. The Lower Mind frantically holds onto its animal dominated domain of control through the fight / flight reflexes of survival and sexual procreation, making choices of reactive behaviour all based on fear induced principles causing constant consciousness separation. The Higher Mind is the polar opposite, filled with the wisdom of connectivity to all consciousness. Its sole purpose is to call all consciousness back into the One Supreme Expression and celebrate the individualised streams in all their glorious forms that complete the picture of the Whole. The Lower Mind continues to struggle with so much fear of death and non-survival, that it resists the merger with Higher Mind. This Lower Mind, known by many as the ego or sabotaging subconscious, continues to argue for fear-based survival. Not willing to subjugate power to another presenting force even when that force is filled with love, light, joy and power, it must at all costs remain locked in the outdated model of animal survival mind. It cannot risk extinction and so remains in a state of constant re-creation of the outdated paradigm. This persistence of fear and control-based rationale caused the Lower Mind to retreat further into the lower frequency abyss of darkness, forgetting the promised possibility of the joy and bliss that connection with Higher Angelic Mind brings. Over time the separated ego mind began to equate itself as being the only supreme answer to life’s ills, questions and identity, attempting to exist without the wise direction from the Greater Mind. Darkness filled the space where light dwelt and consciousness slipped into a slumber. Disconnection, fearfulness and joylessness replaced the ecstatic bliss that spiritual union brings. Seers, sages, prophets, holy men, yogis, saints, shamans, Buddhas and Christed ones all have stories of instantaneous awakening and reconnections of the spirit. Their consistent seeking peeled the layers of darkness and slumber from them and the light that was never really extinguished shone forth. The special pathway they found was one of Divine SURRENDER. This word surrender is pertaining to COMPLETE relinquishing of power; the letting go of the Ego’s notion that it is the Supreme All-Knowing Consciousness and nothing exists beyond it, no longer in control. It cannot continue to manipulate, push, pull, change and diminish and still fill the void within, with Love, Joy, Peace, Wisdom and Fulfilment. 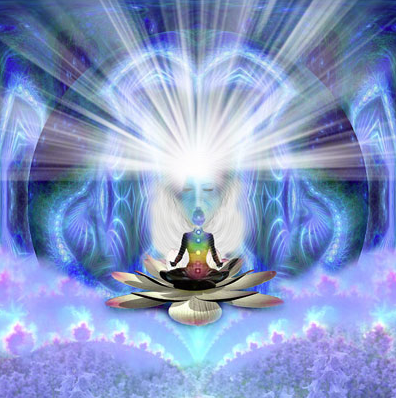 It must stand aside, surrender all created thought, feeling, perceptions and actions of the Lower Mind so that the transcendental light of the Angelic Super-consciousness seeps through in increments into the darkened reality of the Ego Mind. It then transports, transfigures and enlightens the lower mind frequency of consciousness and builds a foundation into which the new Angelic Humanoid can be created and maintained. Gifts of compassion, empathy, intuition, wisdom, insight and joyfulness begin to unravel and transform the multilayered structure of the human experience. We become a whole new species when we have the courage to surrender the lower mind perceptions and accept the overwhelming gentle presence of the Higher Mind, opening further exploration into the ultimate awakening to God Consciousness. Sometimes this process is fast and for others it is consistent but slower. It is our birthright. We are greater than we think we are. The use of meditation as a tool for the process is long known for its power to transform and enlighten. There is no reason why any human should be left bereft of insight and joyfulness. Start your journey today; peel the layers of sleep apnoea from your being. Wake up to who you really are. No matter how hard or how long it takes, never ever give up your birthright to remember you ARE the Higher Mind with Angelic potential, whilst the Ego/ Lower Mind of the physical realm is to serve and support that process. Not the other way around.